Upper Dungeness River – This 6.8 mile round trip can be steep as it parallels the Dungeness River, but it’s mostly gentle. Stop at Camp Handy for lunch, and then continue on to the Royal Lake extension. It is one of the most beautiful hikes in the area, and worth every ounce of effort (you’ll want to be in good shape for the extension, though). Rain Shadow Loop Trail is a .5 mile hike round trip. It’s a short but steep journey with a stunning 360 degree view at the summit of Blue Mountain. Slab Camp Creek and Grey Wolf River is a great place to go to get away from the crowds. This 5.5 miles round trip hike is rewarding when the wildflowers are in bloom in late spring/early summer. Mt. 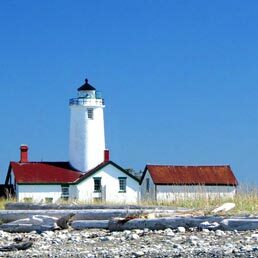 Townsend is one of the most popular hikes on the Olympic Peninsula. One look at the view from the top, especially at sunset, will tell you why. 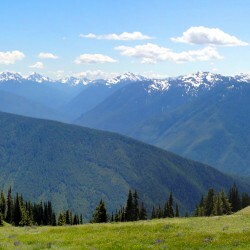 Deer Ridge Trail is a 9.8 mile roundtrip hike takes you into the Olympic National Park. 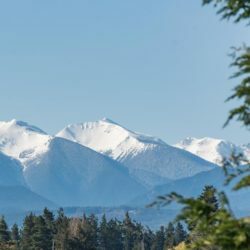 It’s a tough hike, but you’ll love the astonishing views of the Olympic and Cascade mountains at the end. And did we mention the wildflowers? Whether you’re an experienced hiker or just earning your blisters,now is the time to book your room at the Dungeness Bay Cottages this summer.